A. R. Penck (real name Ralf Winkler) was born in Germany and studied painting and drawing for a year in 1953 with Jürgen Böttcher. He is mostly self taught, as he was unsuccessful at applying for art academies. That probably explains why much of his work looks rather primitive. 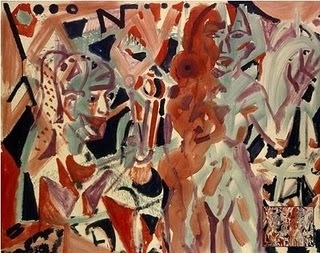 His works can be seen at the Michael Werner Gallery website or at the MOMA Collection website. 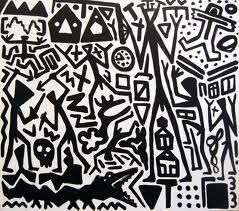 What makes his work interesting is his symbolism and figures (that are reminiscent of cave drawings). The simplistic forms, pictorial, signs motifs and symbols against a neutral background hold an intense energy. It also shows his influence from Picasso.